Imagine you are in an unfamiliar part of the city or travelling to a city you have never been to before. You park your car and went on to shopping or some other thing and when you try to return you no longer remember where you parked your vehicle. This happens a lot and when it happens it could become very frustrating. To avoid this situation there is a simple trick that involves your iPhone and the Maps application. Using this trick you can mark the location of your car on the map so you can instantly find out where it is in case you forget where you parked it. In order to do so follow the steps below. Park your car at a safe parking space. 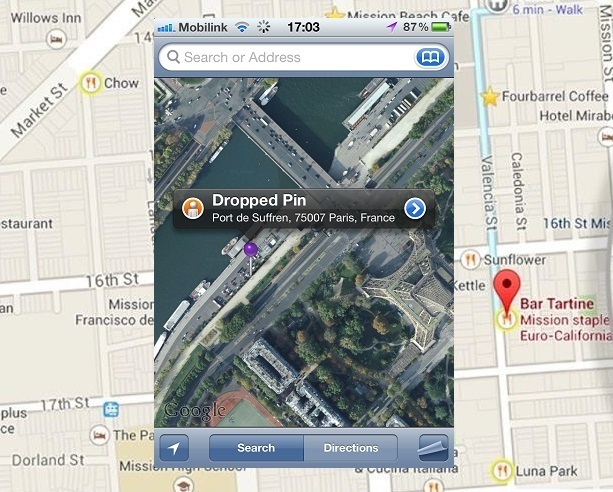 Now take out your iPhone and launch the Maps application. It does not matter if you use Google Maps app or the stock Maps as this trick works on both. Now using the device’s GPS navigate to the location you are currently standing in – this should be the location of your car as well. Tap on your current location and hold until a pin is dropped on it. That’s it. Now the location where you parked your car is marked in Maps application and you can use it if you experience any difficulty in locating your vehicle. On Google Maps you can also save the map for offline use by typing ‘OK Maps’ in the search field in which case the dropped pin will still be accessible to you even without internet connectivity.